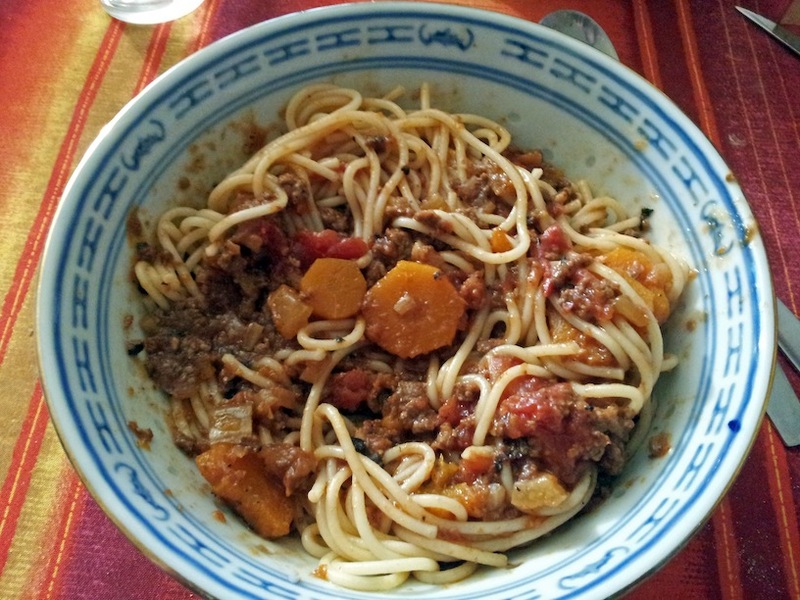 I am not calling it ” bolognese”, mainly because actual Bolognans (and actual Italians) would have a fit… The key to the dish is having plenty of umami, and the tomatoes certainly provide that! I use capuliato di pomodoro, diced tomatoes in olive oil which my mom provided to me and that basically keep forever (mine are a bit old and probably only suitable for this, their taste is a bit less intense than it used to be. Again, I’m pretty sure actual Sicilians will be having a fit–I never was quite certain what the use was for capuliato, but I strongly suspect it’s not meant to be used to boost mediocre canned tomatoes). If you don’t have capuliato, can I suggest ketchup? And if you don’t have the soybean paste, which is probably not a staple of your kitchen, you can substitute it with a bit more carrot or a bit more capuliato. Cube the fennel bulb, the carrots, onion, and garlic into small pieces. In a large heavy-bottomed saucepan on medium-high heat, pour some oil, put the vegetables, cover with a lid and cook for about 8 minutes, stirring occasionally. Add the minced beef and energetically stir to break the mince. Fry and stir until the meat is cooked. Sprinkle the flour over the mix and gently fold it in. Add the tomatoes with the juice from the can, the capuliato, and the soybean paste. Taste and adjust, you might need to add more sugar to counteract the natural tomato acidity. Bring to a boil, lower heat to lowest setting, and leave to simmer for 1 hour +, stirring occasionally, until the liquid has gone and the sauce is thick. Serve over pasta (the Italians use tagliatelles, I think?) and add the fresh basil in each plate at the moment of serving.